Kettering Town are gearing up for a showdown with Leamington at Latimer Park tomorrow (Tuesday) night. The Poppies extended their unbeaten run to 10 matches with a fine 3-0 win at Chesham United on Saturday and that sent them into the Evo-Stik Southern League Premier Division play-off places for the first time this season. The busy schedule for Marcus Law’s team rumbles on this week with tomorrow’s clash with the Brakes being followed by home clashes with relegated Bedworth United on Thursday night and another of the strugglers Bideford on Saturday. Leamington sit in third place in the table, three points clear of Kettering who still have two games in hand. Law believes tomorrow could be an “exciting evening” at Latimer Park but he insists his team are just focused on hitting the target they have set themselves to claim a top-five finish. 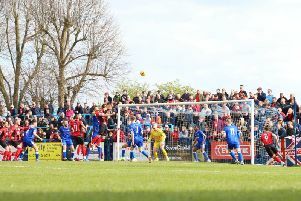 “We have got a target that we want to hit that we feel will secure a play-off place,” the Poppies boss said. “If we want to do more than that then we have to win all our games and hope that points are dropped elsewhere. “It’s obviously a big game because the two sides are both up there. We have still got more games to play and we are confident that we can meet our target even if we don’t win tomorrow. But we will be looking to keep the run going.